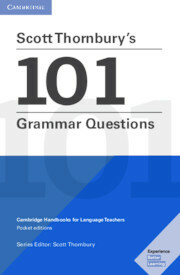 A compact, user-friendly reference book addressing many of the kinds of questions about grammar that regularly confront teachers, both novice and experienced, when planning or executing their lessons. A glance at any web-site, discussion forum or social network shared by teachers of English suggests that teachers are constantly asking each other questions related to pedagogical grammar. These may simply be questions about terminology or categorisation ('What's a clause? '; 'Is like a preposition? '), or they may seek to unravel subtle grammatical distinctions ('What's the difference between for and since?) or explain persistent learner errors ('Why in bed and not in the bed?'). This book is designed to fulfil this basic, everyday need – as well as being a book that can be read for interest, and even pleasure, in its own right.